To help in its mission of building greater awareness of Texas wines, which includes providing credible, juried ratings, the recently launched Texas Wine Journal has announced a partnership with Somm Journal. Starting with August 2014, the bi-monthly publication – published by the same professionals with the Tasting Panel Magazine, with a distribution list of more than 60,000 wine professionals throughout the United States – will publish Texas Wine Journal ratings of Texas wines. The Somm Journal, which also has a growing international audience of wine writers, sommeliers, and other wine authorities due to its online presence, will publish wine ratings regularly, and then, starting in the first quarter of 2015, will feature TWJ’s top-rated wines of the year in an annual issue. The Texas Wine Journal is a publication created by the Texas Wine Consortium, a 501c(3) nonprofit organization; its mission is to create awareness for Texas wines through independent, credible and juried ratings and feature articles and content on the Texas wine industry. Wines are rated by a panel of judges, comprised of wine professionals from several different facets of the wine industry, to provide a comprehensive and objective guide to Texas wines. Each judge has an impact on the final score a wine receives. 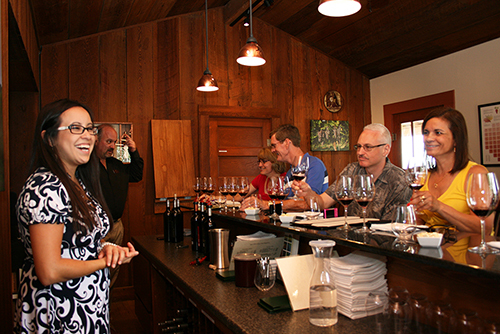 Pedernales Cellars recently opened the doors to its new Reserve Room, with tastings every Saturday and Sunday. The experience is decidedly different than a standard Texas Hill Country winery tasting. First off, it takes place in a small cottage off the main tasting room. There are a maximum of six guests for each tasting, which spans close to a leisurely hour, on Saturdays and Sundays while the winery’s open (with reservations highly recommended). It features six library wines — wines that are typically only available to wine club members and for special events. We asked Veronique Cecilia Barretto of Vinously Speaking, who hosts the Reserve Room tastings, to tell us about her experiences hosting the new series. Any wine lover who enjoys exploring and drinking Texas wines has their favorites. One that sits at the top of my list is Pedernales Cellars, and it’s been there since my first visit to the winery in April 2011. Aside from the knowledgeable and ever-friendly service provided by their staff, what I enjoy most about Pedernales Cellars’ wines is the old-world style in which their wines are made, meaning the wines communicate a sense of place. You can tell each wine is made from grapes that express the terroir they come from. The Reserve Room was created as a way for Pedernales Cellars to have a private tasting room to feature their reserve wines, wines that have limited production, and wines that need just a little extra time to tell their story to the taster. Guests are invited to make reservations to sit down in the stylish and welcoming front sitting room of the late 1800s Fredericksburg cottage on their property and taste through six wines with a personal wine guide, of which I am one. While many tasting rooms exist to allow guests the opportunity to try the wines of the establishment, this Reserve Room has a unique aim in mind that sets it apart from others … to make a connection with both the wines and with the person guiding your tasting experience. It’s the opportunity to really dive into the story of each wine, the story of the person pouring it, and the chance to share your story with us. When I welcome guests into the Reserve Room, I am beyond excited for the unique and enjoyable experience that will come out of the hour we will share. In the few short weeks that the Reserve Room has opened its doors, I’ve had that experience with every single one of them. I take great pride in the time I have to share the stories and educational facts about the wines set out in front of them, about Pedernales Cellars and its family, about the beauty of the Texas wine industry, and about the wine world in general. Aside from the wine and the wine education that is shared during this time, I must say my favorite part of being behind the tasting bar and spending this time with each guest are the smiles and the laughter that inevitably ensue. I think Victor Borge said it best when he said, “Laughter is the shortest distance between two people.” I have such a great time with the guests that I have the opportunity to meet at each tasting, and I know my colleagues say the same. There isn’t enough I can say to describe the great stories we have shared, the wine experiences we gab about, and the tantalizing wine and food recommendations that always seem to be discussed. I have taken to keeping a notepad near me behind the bar because I am always writing down recommendations from guests on the restaurants and wine places I need to go to next time I am in Dallas, Austin, Houston, New Orleans, and even North Carolina! I am constantly writing down names of musicians I need to look up because our wine talk has flowed into musical favorites. I am taking a trip to Napa & Sonoma and many guests have graciously shared their must-sees and must-visits, and the list of tangents is ever-growing. I’m grateful to Pedernales Cellars for creating a space where I get to work with a staff that is rapidly becoming a family to me, where I get to make new friends with each hour I am behind the Reserve Room tasting bar, and where the wine in my glass is always delicious! I once read that the best wines are the ones we drink with friends, and that is exactly what Pedernales Cellars is providing for me and for each guest that walks through their doors.